I have been commissioned to make another quilt for a company (all will be revealed some day) with a very short time frame. Friday 13th will be an all day marathon to get it done in time. Lets hope that 'Black friday' doesn't live up to it's name. I have three machines, they can't all go wrong! 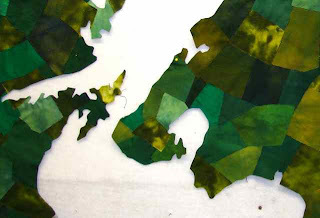 Here is a small bit of the quilt, note that the two islands will be moved to the correct positions soon.